In Baghdad security barriers were emplaced across the city as part of the Baghdad security plan of 2007. These barriers were erected in an effort to stop the violence and establish security within the city. The use of these barriers was unpopular among Iraqi leaders even to the point of the Iraqi Parliament passing a resolution in 2007 objecting to the construction of the security walls. However, the barriers exist and were assessed as being instrumental in an 80 percent reduction in attacks since the Baghdad security plan was implemented. The security barriers were one of several population control measures applied during Operation Fardh Al-Qanoon, which is the name for the Iraqi Government led Baghdad security plan. 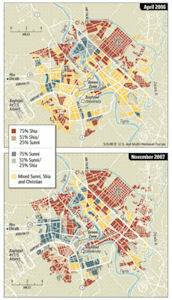 At the beginning of the 2003 war in Iraq, Baghdad was a mixed city of some 5 million people. Sunni Arabs held political power but only accounted for 30 percent of the city’s population. 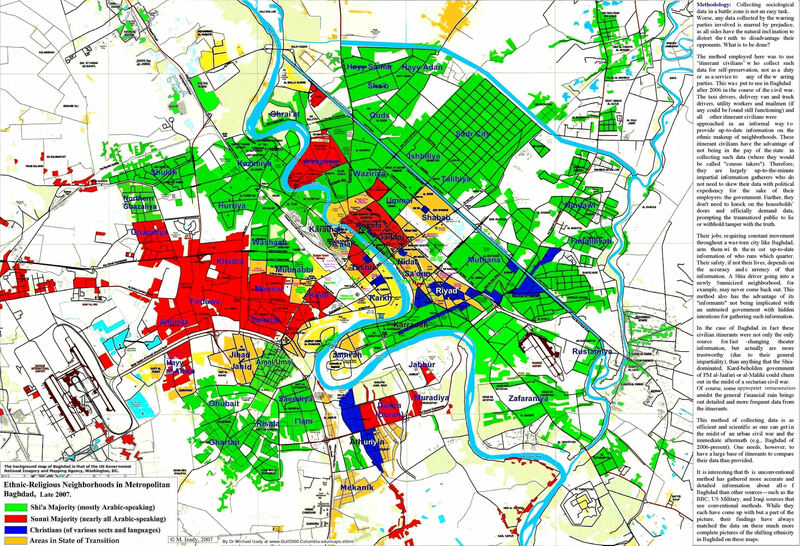 Shiite and Sunni populations were integrated across much of Baghdad, though there were several segregated neighborhoods from both groups also interspersed throughout the city. 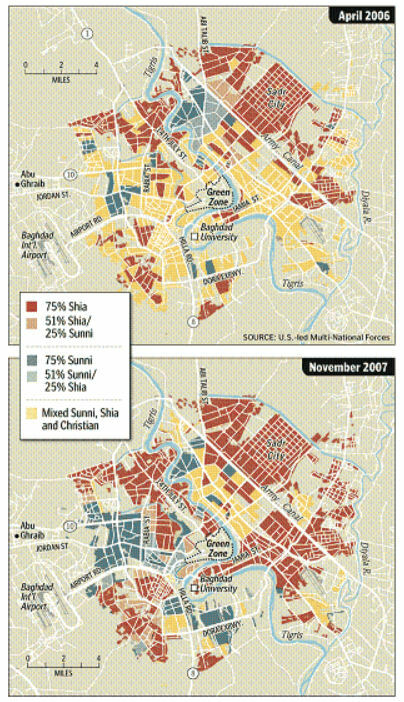 Tensions between Sunni and Shiite populations were strained from historical Sunni repression of the Shiite majority. In April 2006 U.S. soldiers in Baghdad constructed security fences around several Sunni communities, including the neighborhoods of Adhamiyah and Ghazaliya. The fence around Adhamiyah consisted of concrete barriers, was nearly 3 miles long, 12 feet high, and took a month of nights to complete. The Ghazaliya fence was similarly constructed and was 2.5 miles long. It had two checkpoints, manned by Iraqis, and it was also intended to stop reciprocal Shiite and Sunni violence. Brigadier General Joseph Anderson and Colonel Gary Volesky, U.S. Army, wrote a brief account of their efforts to use population control in the July-August 2007 issue of the Military Review. At the time, Brigadier General Anderson was the Multi-National Corps-Iraq chief of staff and Colonel Volesky was his deputy. In their article “A Synchronized Approach to Population Control,” Anderson and Volesky describe population control measures as including “physical activities meant to protect the population; influence operations that engage key leaders and an information operations strategy to build support for our actions; and the promotion, coordination, and facilitation of economic opportunities to reduce the pool of disenfranchised communities that enemy forces can rely on for support.” Anderson and Volesky classify their efforts at population control into strategic, operational and tactical controls with security barriers included as one of the tactical control methods. These massive rebar-laden barriers were deployed all over the Baghdad area. These barriers are strategically placed in order to form solid walls of concrete, forcing insurgents to engage coalition forces on preconditioned terms or not at all. Along with reducing the risk of IED attacks, the barriers serve to cut off exit avenues for criminals trying to stage attacks against coalition or Iraqi forces and thus reduces casualties. 165th Combat Sustainment Support Battalion moved more than 20,000 barriers. At over 10,000 pounds per barrier, this meant that the 165th moved more than 200 million pounds of concrete down some of the most dangerous roads in the world. As security was maintained in Baghdad, some security barriers were removed in certain locations and circumstances, predominately along roads. However, the barriers around many neighborhoods remained. US and Iraqi Army officials insisted the barriers were temporary in nature. During the initial uproar over the deployment of the security barriers around Baghdad, a State Department spokesman said “the walls were a temporary security measure aimed at protecting civilian populations and were not aimed at dividing people in Iraq.” The barriers were successful at reducing incidents of violence. In Ghazaliya, sectarian violence dropped 50-percent in the weeks following the barrier’s construction, and sectarian violence was down in Baghdad overall from 2006 to 2007. But in April 2007 the Iraqi prime minister ordered a halt to construction of the controversial security barrier that the U.S. military had been building around a mainly Sunni neighborhood in Baghdad. After meeting with the head of the Arab League in Cairo, Iraqi Prime Minister Nouri al-Maliki told reporters for the second day he has ordered construction of the wall to halt. He said, "I oppose the building of the wall, and its construction will stop. There are other ways to protect neighborhoods. I should point out that the goal was not to separate, but to protect. I pointed out that this will remind us of other walls that we reject, so I have ordered it to stop and to find other means of protecting the neighborhoods." Iraqi and American officials insist the five meter-high concrete barricade was not aimed at separating Sunnis from Shi'ites in a city that has already grown increasingly divided along sectarian lines. The U.S. military put out a statement attempting to explain its plan to construct what it is calling gated communities in Baghdad, and arguing that some residents had welcomed the idea. Saydiya, a south-Baghdad neighborhood in the Rashid District had many upscale houses and was home to people of some affluence; in south Baghdad's Rashid district, it was a mixed Sunni and Shia area, located along what became a sectarian fault line in late 2006. In late 2007, United States and Iraqi forces cleared Saydiya house by house. In early 2008, concrete walls were erected around the neighborhood controlling access through two checkpoints. 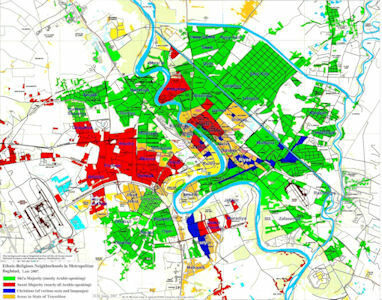 The walled area included about 12,500 houses that accommodated an original population of about 60,000. In late 2007, the Prime Minister's Implementation and Follow-Up Committee for National Reconciliation (IFCNR) appointed a Support Council, a group of 26 Sunni and Shia community leaders, to fill the role of the elected but inactive Neighborhood Council. In the spring of 2008, displaced families were returning at a rate of about 20 families per day.